In medium bowl, mix crushed crackers, coconut oil and brown sugar. Divide mixture among 6 (6 oz) ramekins, pressing mixture in bottom and partly up sides using a small glass (a shot glass is perfect for this). In large bowl, beat cream cheese with electric mixer on high speed until light and creamy. Beat in peanut butter and condensed milk until combined. Pipe or spoon mixture into crust-lined ramekins. Cover ramekins with plastic wrap; refrigerate about 2 hours to set. Serve with remaining ingredients. 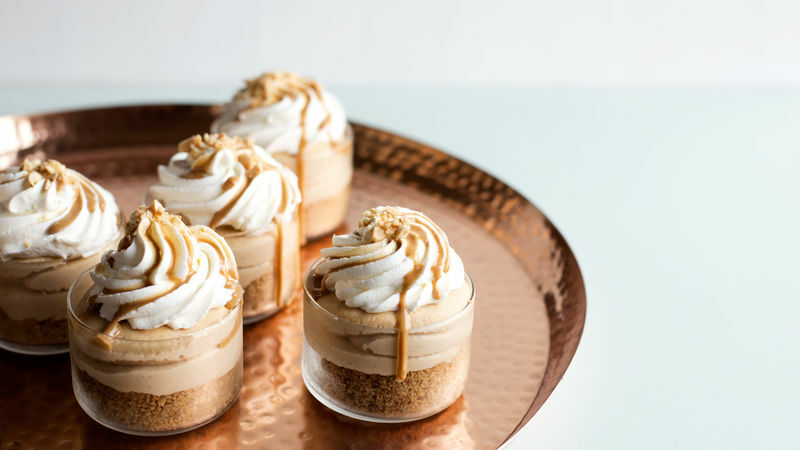 Making a peanut butter shell for topping these cheesecakes is super easy. Just spoon 2 tablespoons creamy peanut butter and 1 tablespoon coconut oil into small microwavable bowl; microwave uncovered on High about 30 seconds or until melted. Stir together, and spoon over chilled cheesecakes. Another great option for spooning over the cheesecakes is some melted jam or jelly (whatever you like on your peanut butter sandwiches!) or melted chocolate chips. Crush graham crackers into fine crumbs with food processor or in heavy-duty gallon-size food storage bag with rolling pin.